The library offers support in the areas of publishing and communicating scientific results. Researchers can learn about Open Access, Research Data Management Plans, IST Austria Research Explorer and Author Identifier. Open Access – unrestricted access to scientific publications – is an ongoing trend in the scientific community. Open Access makes scientific publications and other digital material, such as research data, freely accessible via the world-wide-web. IST Austria is committed to providing unrestricted and free online access to scientific publications for all users and researchers as widely as possible. The main goal is to increase the visibility, use, and impact of research output, and thereby generate added value for the scientific community. The relevance of managing and sharing research data has been growing over the years. Several research funders (e.g. EC) require research data management plans and research data to be as freely available as possible at the end of a project. Besides these requirements, there are many benefits in thinking about data management in advance. Characterize the data you are working with. Categorize the source (observational, experimental, simulated, derived, compiled ), form (text, numeric, audio visual, models, computer code), format, data stability (fixed, constantly growing, revisable) and the expected volume of the data (file size, amount of data). 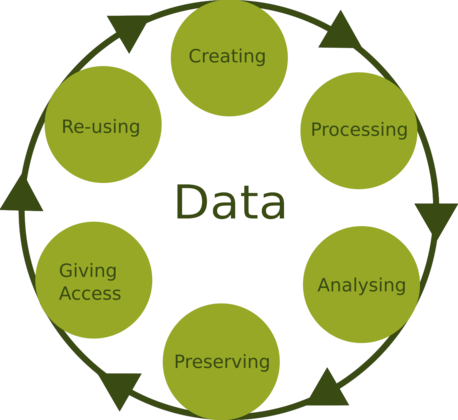 Metadata – data about the data – helps to find, understand, analyze and reuse data. Metadata is the structured element of documentation with fixed formal criteria and only the most important contextual information, which makes it also machine-readable. Privacy / data protection: applies if personal data is collected during the research (especially life sciences). For storing and further use, a declaration of consent is needed and the data has to be anonymized to avoid disclosure of individuals. Copyright: Primary research data (i.p. measurement data) itself are in many cases not affected by copyright but are subject to the public domain. As soon as they are accumulated in a specific order or processed, they are protected (e.g. database right). If you use external data which is copyright protected, you have the option to obtain the usage rights from the copyright holder via a transactional transfer. For sharing and reusing data, CC0 public domain dedication is the recommended license. For explanation and further information see the DCC’s guide How to License Research Data. As to data access during the project, you have to be aware of data security, authentication, access rights, and data synchronization. Data sharing is especially an issue after the project. When preparing your data for sharing, things like formats, documentation, ownership and confidentiality are main factors to think about. There are various ways for data sharing. The most common ways are sharing via email or physical device after an individual request, putting it online on a personal webpage, adding it as supplementary material to the publication at the journal’s platform, depositing it in an open repository and publishing a data paper. A number of funding agencies (EC, FWF) and science publishers (Nature Publishing Group, BMC, PLOS) require data sharing underlying published research via an open repository. Nevertheless there are reasons to restrict access to certain data or parts of it (e.g. sensitive data, copyright protected data). Present a strong case for any restrictions on sharing, such as embargo periods or restricted access, and ensure these are properly justified. At the Institute of Science and Technology Austria an institutional and publicly accessible data repository (IST Austria Research Explorer: research-explorer.app.ist.ac.at) for data publication and sharing is provided. Furthermore deposited data is registered with DataCite and therefore assigned a DOI which enables data citation. (Name of the project/researcher/etc.) commit(s) to data deposit in IST DataRep within the period agreed, for data which are appropriate to share. If you find a suitable subject repository, we recommend you choose it over the institutional repository as subject repositories can provide very particular services to subject specific requirements. How to store and backup data during the project are issues that need to be considered. Besides taking into account the resources already available, it is important to evaluate and decide on further measures if necessary. After the project data might have to be retained for different reasons (Austrian data protection law DSG, funder requirements, long-term value of the data). Preparing data to expected standards for archiving are time-consuming processes, for which you should allocate significant resources. Data, which underpin publications, should be extracted, captured in machine-readable form and deposited in a repository so they remain accessible. Make sure you know about any repository policies that might affect your data (e.g. accepted data, preferred formats, normalization processes). IST Austria Research Explorer is the new institutional repository at IST Austria which combines the former IST PubRep, IST PubList and IST DataRep within one repository. It contains all publications, published research data and grants from researchers at IST Austria and supports the mission to make research at IST Austria as accessible as possible to the public. The data sets are provided with a Digital Object Identifier (DOI), which allows persistent citation. The system is based on the software LibreCat, which is developed by the Universities of Bielefeld, Ghent and Lund. Researchers affiliated with IST Austria can add publications via different import functions (e.g. using DOI, ArXiv ID or PubMed ID ) and publish their scholarly papers Open Access under the conditions of the publisher. The IST Research Explorer therefore enables researchers to meet the requirements for Open Access to the research cycle as defined by such grants and funders as the ERC Horizon 2020 or FWF. The metadata records (except the copyright protected abstracts) are available under a CC0 license. This manual guides you through creating a new entry in the institutional repository. This manual explains how to search and find items in the institutional repository. This manual deals specifically with creating a new research data entry in the institutional repository. This manual guides you through creating a new entry for a PhD thesis in the institutional repository. Please find here a first insight to Creative Commons Licenses. How to create a PDF/A document? This manual explains how to create a PDF/A document (which is needed to upload your PhD thesis to the repository). What is an Author ID? An Author ID is a persistent and unique digital identifier that allows researchers to distinguish themselves from other researchers and to unambiguously link themselves to their research activity. Why should a researcher have an Author ID? makes it easier to get credit for scientific work. simplifies the grant submission workflow for funding organizations and makes tracking the output of the research that they funded easier. eases the tracking of achievements of members of scholarly societies. helps institutions to collect, display and evaluate the research activities of their faculty. makes (electronic) paperwork much easier. Personal details need not be filled out in electronic form since researchers can simply use their Author ID. ORCID is run by the non-profit organization Open Researcher Contributor Identification Initiative and provides researchers with a unique Author ID. It is used across nations and disciplines and is available free of charge. In order to get an ORCID you need to register online. To do so, go on the ORCID website http://orcid.org/ where you will find the instructions on creating your own ORCID. Once registered, you can link your ID to other Author IDs such as ResearcherID or Scopus Author ID. ResearcherID is a feature of the Web of Knowledge database. It connects all your publications that are listed in the Web of Science to your personal profile. You can also be connected with other Author IDs, such as ORCID. To create a ResearcherID you need to register on the website http://www.researcherid.com/SelfRegistration.action. After filling out the form and submitting the personal details, an ID and a webpage will be provided. The webpage can be used as a link to the personal profile. A Scopus Author ID assigns researchers with a unique number and makes it possible to group together their documents. It is possible to assign variants of the author’s name to one single profile. This helps to connect an author to their work even if cited in different ways. Scopus automatically creates an Author ID for you when you publish in a journal that is indexed by the database. It is very easy to link your scholarly publications to ORCID through a direct link on the author detail page. To creat a Google scholar citation profile, go to the website http://scholar.google.com/intl/en/scholar/citations.html. You need to have a Google account to create a profile. Sign in to your account and register online for your citation profile. If you set your profile to public, your information can be found in Google scholar when somebody searches for your name.